It’s been several years since you purchased that 1970s “bargain” boat, and you’ve been upgrading the systems and exterior to “yacht” condition. Throughout the process, you’ve ignored the orange plaid upholstery, fake paneled bulkheads (interior walls), and chopped-up design inside the vessel. Now it’s time to tackle the interior, and you have a sudden urge to begin the redesign with a sledgehammer and hacksaw. Although you desperately want to remove every trace of the old interior right now, you’ll achieve a better result with some advance planning. Decide how you will use the boat. There are different kinds of boating. Depending on your choice of boating “style,” the interior design will be different. If you are planning on some extended cruising, for example, a small galley (kitchen) with handholds and brace points is essential. The same philosophy applies for berths (beds) on the vessel. While underway in rough weather, spacious, supportive berths will help the crew rest without fears of being propelled across the room (see Reference 1). Create an interior design. Make a list of your desired interior features, and search magazines and websites for practical examples. Combine this information with your budget guidelines, and create a design that works for the crew. If you don’t feel qualified to perform the design and load calculations, contact a yacht designer or naval architect to assist you (see Reference 2). Take some “before” photographs. Although you might not want to remember the current garish interior, note the location of bulkheads and posts that reach upward to the deck. On many boats, for example, these supports are essential for the structural integrity of the boat. The photos will also show the current positions of equipment such as galley stoves, navigation panels, and heads (lavatories). Hire professionals if necessary. Determine how much of the interior renovation you can safely complete. 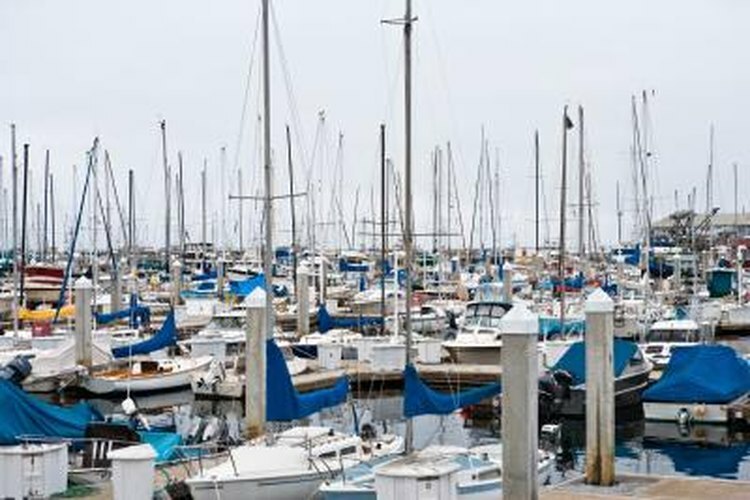 For example, unless you are an electrical expert, hire an American Boat & Yacht Council (ABYC) Certified Marine Electrician to plan and execute the new electrical system (see Reference 3). If you’re a good structural carpenter but lack finish skills, a fine woodworker can help you create the polished look you desire. Divide the renovation into manageable parts. Make a supply and equipment list for each portion, and ensure that everything is on hand before beginning your project. For example, starting a fiberglass project without enough glass cloth, resin, or tape may mean you won’t be able to completely cover that surface. Because fiberglass work involves chemical reactions and fumes, forgetting your respirator can lead to serious health risks. Clean up your mess as you go. This will be helpful for two reasons: You won’t have to search for parts and materials under a growing pile of debris, and you won’t track paint or solvent into an area already completed. How Do I Decorate Pontoon Boats?